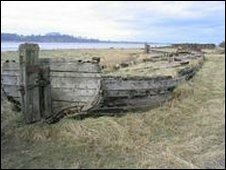 Archaeologists are working at a ships' graveyard known as the Purton Hulks in Gloucestershire to expose and record the remains of a barge. Laser scanning equipment is being used to capture 3D images of the Kennet-built Harriett. Eighty ships and barges beached in the 1940s were used to shore up the Sharpness Canal against erosion from tidal flow of the River Severn. Efforts to save the site for the nation was begun by the Friends of Purton. Laurent Coleman, head of archaeology with The Friends of Purton, said exposing the surviving timbers of the vessel would enable them to study the vessel's construction and its current state of preservation. "In addition, this excavation will address specific areas of interest including the dimensions of the keelson and construction of the mast step, and assess wear and tear of the remains of this immensely important and rare example of the country's only remaining Kennet-built barge," he said. The Purton Hulks received national exposure on the BBC programme Coast in July and will be featured on the investigative reporting series Inside Out West. The sunken boats are early-20th Century coasters, schooners, trows, and barges. Harriett was lost 21 February 1944 at Stonebench Turn on the Sharpness to Gloucester Canal, following a collision with motor barge Severn Trader. Mark Beattie-Edwards, Nautical Archaeology Society programme director, said: "The NAS is very excited to see just how much survives of the Harriett at Purton. "We are looking forward to learning more about how this vessel was originally constructed and perhaps later modified by its owners - she really could give us a window into the past."